PWL you so relentless with the snow concept, realistically it could snow still this time of year but you wouldnt have hardly anytime to enjoy it. The models are a disaster right now, each one has there own idea of whats going to pan out this week. Give it up PWL,pipe dream,now go enjoy the warmth. Well to answer your question PWL,yes someone did say snow,Paul Douglas's blog has mention of snowflakes mixing in with rain north/east of metro on Monday night and if you believe the GFS(not many here do)its brings a good dump of cold air for a few days the latter half of the first week of April with highs in the 30's and lows in the 20's with some snow....as far as the above freezing streak goes for the month of March it looks like it will come close to ending next Wednesday night with lows hovering just above freezing at this time,thats almost 19 days in a row above freezing in the month of March,remarkable!!!!!!!!! OK first of all this post is going to create some interest. As far as severe weather Monday night through Tuesday, it looks marginal at best as the models have hard time agreeing on anything, stay tuned, if any severe it should stay west of the metro. But things are starting to align up for the 1st 10 days of April that I don't like. Without getting into specifics I think the 1st 15 days of April will bring a major snowfall from the Northern Plains to the east coast, where is to early to tell. Today (March 24th) is the first day since March 12th that we have not set some form of temperature record. The overnight low (daily minimum) of 51 missed the record by 1 degree (52 in 1945). Prior to today, we set high daily minimum records 10 of the past 13 days, including every day from 3/17 thru 3/23. That is absolutely unprecedented. Our high temps this month are running 21 above average; low temps are 19 above average. Finally, our average lows are running 2 degrees above the average HIGH. I love this warm weather, but keep talking randyinchamplin!! One more heavy wet snow would be great. Let's break some record with that!! I guess I shouldn't say that it's unprecedented. But it appears that the only similar stretch of record-setting weather is the infamous July 1936 heat wave. That set eight high records and seven (consecutive!) high daily minimum records -- over the course of 11 days. Jeff Masters has had a great series of blogs about this recent weather. You can definitely tell by Friday's blog that he was becoming exasperated at trying to describe the historic nature of this month's warmth. Great writeup. Thanks for passing along. I also tweeted it. Even though it will be bad for business,you have perked my interest Randyinchamplin........keep talking!!! Looks like more cold seeped in than expected overnight. The NWS Friday night forecast for a Saturday night low of 47 was off by nine degrees. Randyinchamplin tell me more about this 'major snowstorm' of yours,I haven't even heard from any outlet about any snowfall or even it being cold enough for snow. Wishcasting, I dont see anything major anytime soon, even if the cold air could come in, most on southern and central canada is snow free, the cold would modify significantly. Today is the first day in 12 days where the overnight low was NOT warmer than the average high. I have to admit that I would not mind a good, hard freeze. I had to spray for weeds in my yard today. God I hate that. A nice freeze might at least slow them down. well I guess I have some splaining to do. First my idea's are formulated by looking at several of the teleconections from the ECMWF. The North Atlantic Oscillation is forecast to go negative to neutral, that is a strong to weak signal that blocking will set up over Greenland. The Eastern Pacific Oscillation is forecast to go positive to neutral which would mean near normal to below normal temps. The Pacific North American Oscillation is programed to be positive to neutral, which again is showing a cold solution, and this one is key, a positive to neutral profile would mean that any trough's out west will likely be offshore, allowing the axis of the ridge to build into the Rockies. I wish I could find the Arctic Oscillation for the ECMWF, but the site I use for ECMWF telleconections has found a bug in the calculations and has pulled it down. So using the GFS and GEM products it looks to be negative to ever so slightly positive, which is big change from the astounding positive values we have seen all season. In other words the polar vortex will not be as strong and pieces of cold could break off and move south. I have been waiting for the CFSv2 to make the adjustment to the telleconectiions and it finally did today. Here is what it shows for weeks 1 and 2, followed by weeks 3 and 4. I believe that weeks 1 and 2 are over done, and week 3 I think has the core of the cold to far west. Keep in mind that these temp anomalies are for a week and they average the 7 days based on both high and low temps for each day. Now let me repeat what I said with my previous post, I expect a major snow event somewhere from the northern plains to the NE US, I never did say I was expecting it for your back yard (if it is anywhere close to the metro.) Frankly it's to early to know where the surface features will set up. This could be a multi million dollar disaster for the Fruit Orchards over the northern part of the country as many of the Fruit trees have started to bud out. Very interesting Randyinchamplin,your usually pretty close with your statements and outlook,we'll see what happens,what's Joe Bastardi saying about a potential major snowstorm,if I remember correctly he was calling for one last April,anyhow if we receive a major snowstorm here in the cities after all this record warmth it will just be a icing on the cake with the bizarre winter/early spring he are having. 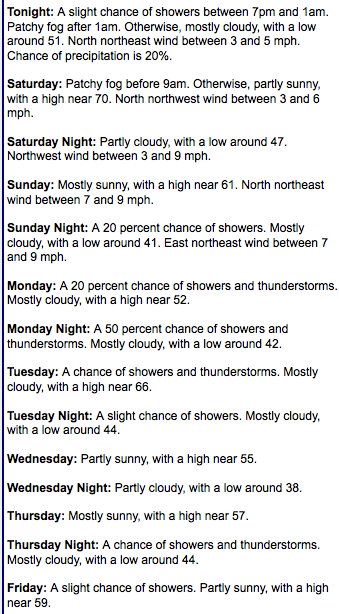 Well DD has a drastic change for early next week and even mentions the 's' word for late Monday into Tuesday,he's got temperatures going from mid 70's to mid 40's from Sunday into Monday.......while wunderground has a high of 82 for Monday...something has to give,what u say about this Randyinchamplin? I, for one, and not buying on what the GFS is trying to sell. Something overall about it doesn't feel right. That system for next weekend does, however, look pretty darn interesting. Another potentially agressive low (even deeper than the one moving through on Tuesday) with maybe more heat and humidity along with it. If temps tomorrow (Tues) would have been into the 80's with dews even in the upper 50's, it probably would have meant outbreak. But, temps look to remain mostly in check, deep moisture is lacking, and the front is coming through before any instability can build. Watch that system next weekend for perhaps an outbreak of severe storms. Models aren't agreeing that far out, but it is something to monitor as the week goes on. I agree Duane the GFS is hinting at severe followed quickly by snow for somewhere in the Dakota's to MN. Wish the Euro would catch on.